Let musician and Austinite, Dr. Joe, take you on a tour of his hometown that celebrates music, art, food trucks, and everything else that makes this Texas capital wonderfully weird. Hundreds of rusty, broken-down bicycles tower overhead, welcoming you with the impossible architectural grace of a Baroque cathedral. It’s not a surreal dream, and the cathedral vibe is no accident. This is a living sculpture lovingly built from over 60-tons of discarded steel in the backyard of local artist Vince Hannemann’s home. 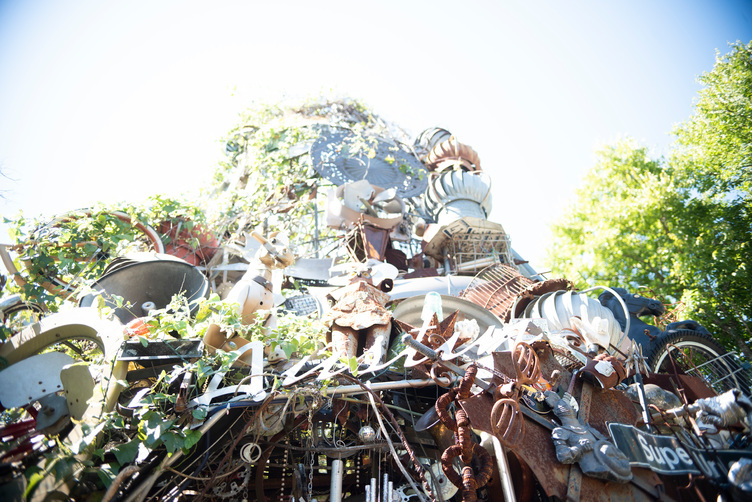 He calls it “The Cathedral of Junk,” a title that hints at the secret of Austin’s thriving creative culture: anything goes here just as long as you don’t take yourself too seriously. The city does love its music. Austin has long been an incubator for icons such as Janis Joplin, Stevie Ray Vaughan, and Gary Clark Jr. It also plays host to iconic music festivals such as SXSW and Austin City Limits, drawing people from around the world to this music mecca. But long before the big festivals, the music scene could be boiled down to one word: honky-tonk. In the early years of the 20th century the swinging, two-stepping, hollering culture of honky-tonk was prevalent in the city’s rowdy German beer halls (prost!). It’s both a style of music, and a term for the local watering holes where you’ll hear that music. Honky-tonk quickly put Austin on the map as an enclave—a place where all music, and all people, were welcome. And this accepting attitude still defines Austin today. Hungry yet? Austin has an incredible diversity of food trucks, reflecting the same spirit of creativity that the city brings to every aspect of life. Thanks to the city’s growing popularity for young and fearless entrepreneurs, these restaurant start-ups are plentiful around town. Although Austin trails Los Angeles as the American city with the most food trucks, still no matter what type of grub your stomach desires, you can find it on four wheels in Austin, Texas. And, lastly, if you need to loosen up after all that loosening up there’s always Barton Springs. A crown jewel of Austin, the natural swimming pool is fed from underground fresh water springs within the lush Zilker Park, where hikers and swimmers take in the warm, sweet air protected by southern live oak trees. It’s truly a treasure of the city.